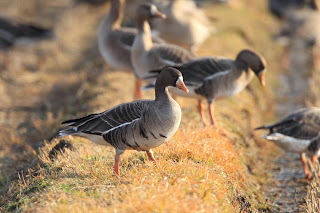 The White-fronted goose, also known as the specklebelly, gets its reference from the black bars found on its breast, particularly the mature ones. They’re typically called “Specks” or “bar bellies” on our Missouri late season goose hunts, thanks to the black bars immediately behind the lighter tan chests found on the adult geese. They are typically medium-sized geese, weigh in between four and six pounds and have slender and agile wings. A good way to identify them from a distance is the way they fly and the distinctive white rear bottom below the tail and back half of their stomach. They often fly lower than many geese and in smaller flocks than snow geese. White-fronts have a distinctive high-pitched vocalization it sounds rather like someone laughing very loudly. Hunting adult specklebellies is no Sunday picnic while goose hunting Missouri, and there are many, very mature birds out there. They feed on much of the same marsh grasses, aquatic plants, tundra plants and fresh-plant growths in fields as do the lesser snow goose. Missouri guided goose hunts have gotten very popular, particularly in Southeast Missouri; in the boot heel running along the Missouri/Arkansas border, where rice is found in abundance. Here, you’ll find large wintering populations of White-fronts and Snow Geese. These hunts typically take place during late December and January in Missouri’s south zone. Hunting in farm fields requires permission from the farmers and even the individual(s) who own that particular piece of land. It’s good to get permission as many farmers already lease these fields out to local hunting guides and outfitters. Missouri conservation officers will often ticket trespassers some of these lands may even have painted barrels on field roads to notify potential trespassers. After Missouri goose hunting season opens, you need to figure out where the geese are. Even if they were found in a particular area yesterday, there are no guarantees you’ll come across them again. Study movement patterns throughout the season; identify likely feeding places and roosting ponds. Specklebelly geese choose fields randomly, but as mentioned, once they do they’ll keep coming back until the primary food is no longer being found, or they have been harassed. White-front flocks are commonly found with or near Snow Geese. Decoys used for hunting white fronted geese are made up of wind socks, shells, silhouettes and full-bodied decoys who closely resemble White-fronts. Keep the decoys spaced a few feet apart in small family groups this gives the appearance of a relaxed feeding flock so an approaching flock will find it an inviting area to land in.